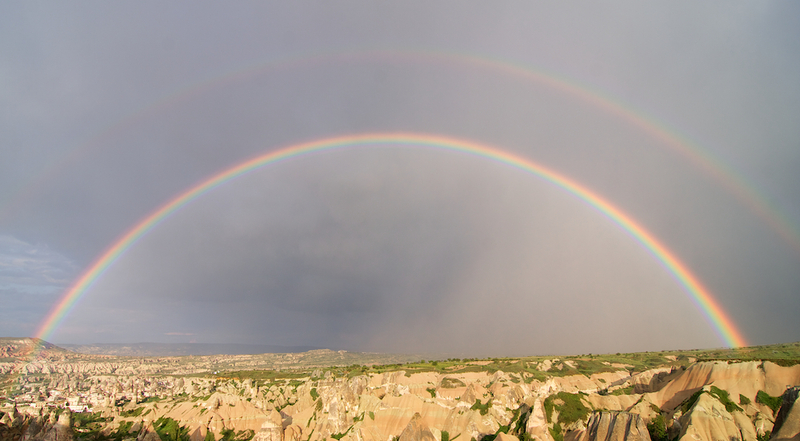 While driving down the highway on the way back to our hotel in Cappadocia, we saw a beautiful rainbow. The bus stopped so we could shoot a few photos. This was the first full rainbow I’ve seen from end to end. We were in the perfect spot. While we were standing there taking photos, a second rainbow appeared! I’ve never seen a double rainbow before, so I was thrilled. I promptly grabbed by 11mm wide angle lens and snapped this photo. Read my favorite quote about rainbows from Ian Stewart’s Letters to a Young Mathematician, pages 7 and 8. More photos from Cappadocia and Sanliurfa are coming soon!